You only need the single PSS License that you purchase right from Ship Works. Since we pull orders from both Amazon and eBay we act as a funnel into the single license. All the orders come into PSS then go to your ShipWorks computer, after you have shipped them, the tracking comes back into PSS, marked as shipped, and then sent to the appropriate marketplace. You will have to integrate FedEx, UPS, USPS accounts into Shipworks yourself. The Username and Password you enter here will eventually be put into Shipworks. 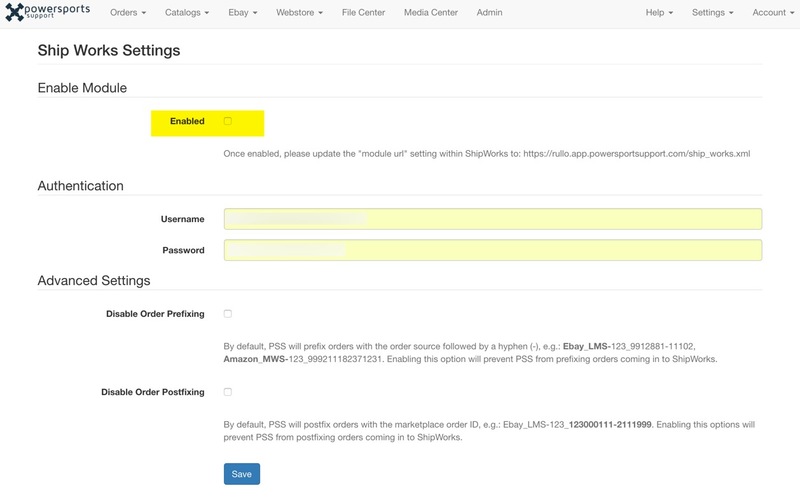 PSS gives you the ability to Disable Order Prefixing and Postfixing. The notes in PSS should be fairly straightforward regarding what these fields do.